Tickets: $8.00 Children under 12 years, FREE. 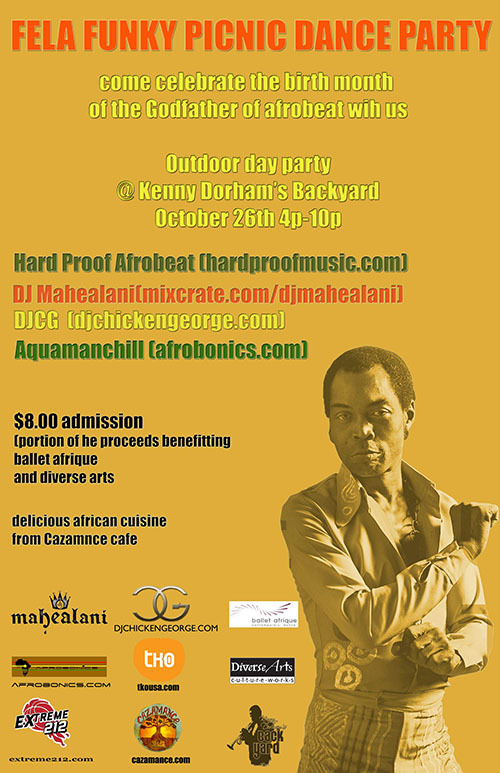 In conjunction with DiverseArts, Extreme212.com, Cazamance Cafe and tko advertising, afrobonics.com is throwing a daytime "Fela Funky Picnic Dance party". Celebrating the life of Fela Kuti, the godfather of afrobeat. The event is being held on October 26th from 4-10pm. Tickets are $8.00 and a portion of the proceeds will go towards Ballet Afrique and DiverseArts. Children under 12 free!